A portrait of a woman standing in a homestead holding a gourd vessel on her head. Beyond her can be seen several other onlookers and domestic objects outside a hut. The vessel is possibly full of water since her married woman's skirt is wet and sticking to her legs. The image was taken by A. N. Tucker, who worked as Linguistic Expert of non-Arabic languages for the Sudan Government from 1929 to 1931. Evans-Pritchard met Tucker when the latter visited his fieldsite in 1930, after which time he gave him these prints. Note on print reverse ms pencil - "24"
Morton, Chris. 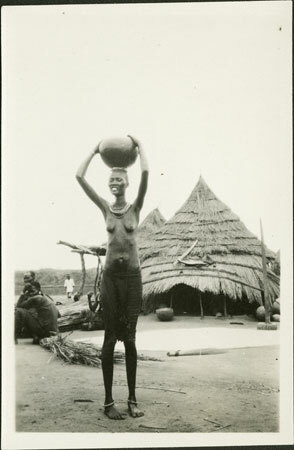 "Nuer woman holding vessel" Southern Sudan Project (in development). 03 Jan. 2006. Pitt Rivers Museum. <http://southernsudan.prm.ox.ac.uk/details/1998.355.577/>.